I am not yet ready to roast my own beans and as such, must live vicariously. Please share your home roasting set-up. Let's see those pictures. I use my homemade rocket stove or a single burner propane stove and an 8" cast iron skillet. Spread everything on a cookie sheet when done and blow off the chaff by pouring from the pan to a colander (back and forth). OK I will start it off. This is my modified Quest M3 roaster.I modified it by wrapping insulation around the outside of the Drum area. The Aluminum covering on the insulation is just for pretty. The insulation allows me to increase the capacity of the roaster from 250 gr to 300 gr. In addition, it allows me to roast even when the ambient temp falls as low as 40 degrees F.
I had a Behmor 1600 as a backup for years. The quest has never given me a moments problem. I got my next door neighbor hooked on home roasting and sold him my Behmor. He still thinks I am nuts because of my passion for wet shaving. This man is serious about his home roasting. (10-30-2013, 08:45 AM)Johnny Wrote: This man is serious about his home roasting. Great setups, gentlemen. Thank you for sharing your methods. Barry, if you can get your neighbor hooked on home roasting then I'm sure you can get him to be a devoted wet shaver. Just remind him to join TSN once the ADs kick in. 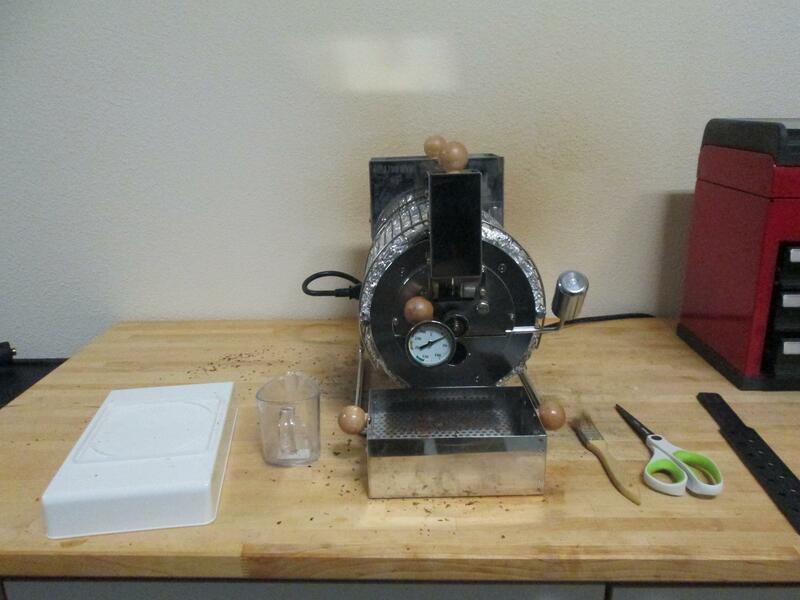 I'll see if I can get some pics, but my strength training partner (a wet shaver as well, btw) converted an air popcorn maker into a smal batch coffee roaster. The setup does a bang up job with medium roasts but falls a bit short on darker roasts. 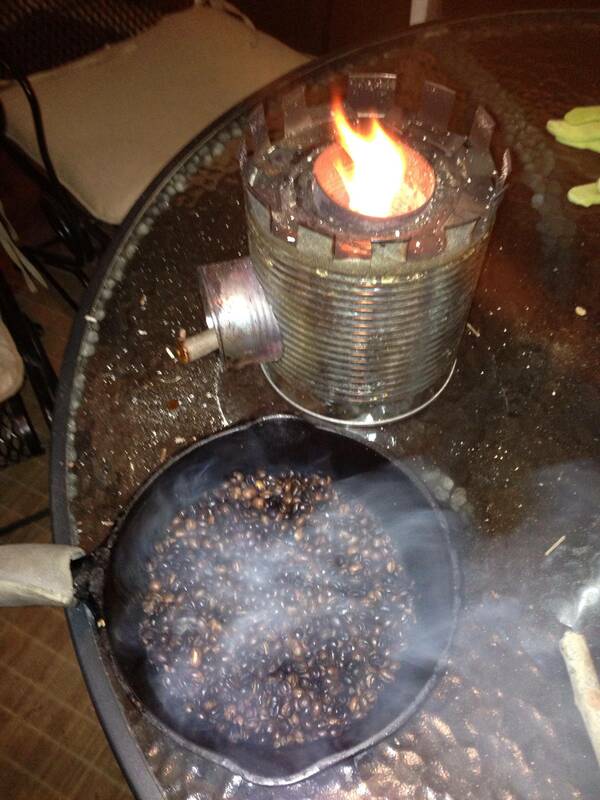 (10-30-2013, 06:55 PM)ojinsa Wrote: I'll see if I can get some pics, but my strength training partner (a wet shaver as well, btw) converted an air popcorn maker into a smal batch coffee roaster. The setup does a bang up job with medium roasts but falls a bit short on darker roasts. The popper can be modified using a split wire. There are instructions on Sweet marias Forum and or Coffee Geeks.It is an easy wiring fix. Then he can go as dark as he likes. Owens/Sweetmarias when he was running his business out of Columbus, Ohio (2001ish). It still works! ...but I have moved on. The batch size on the Hearthware is about 85 grams (it came with a 1/2 cup scoop). This was fine when I was single, but I really needed a larger batch size (and I still do). The Hearthware blazes through roasts in about 6-7 minutes, which I think affected the quality of the cup a bit. 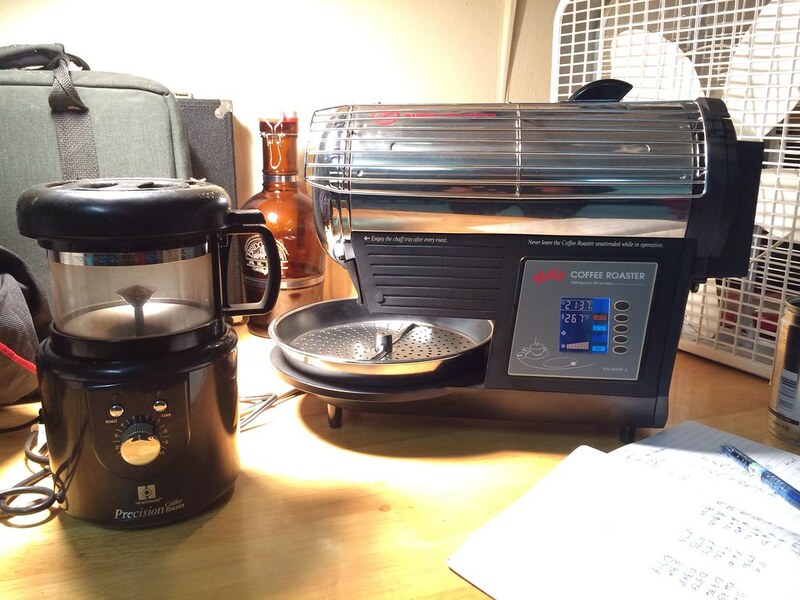 The Hottop (machine on the right) is a wonderful roaster. 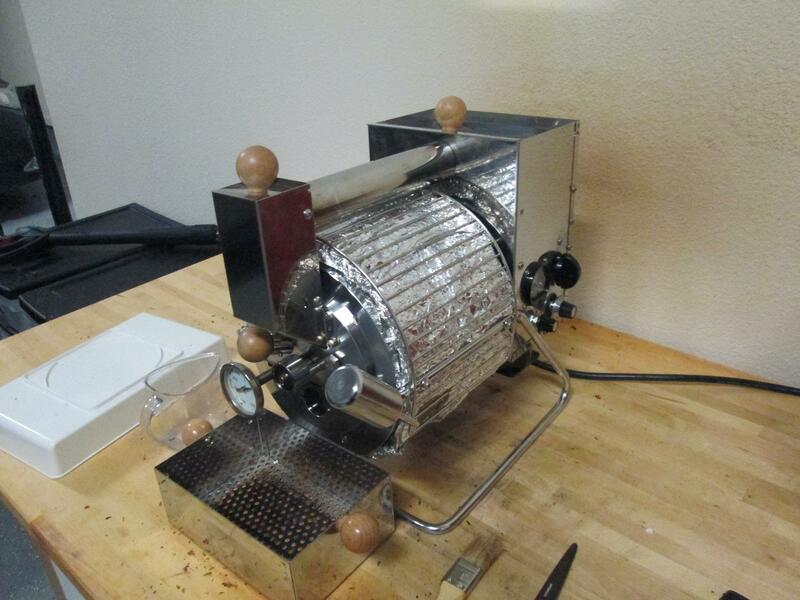 Here is a machine that allows you to achieve a professional quality roast consistently. Batch size is 225-250 grams (I roast 1/2 lb at a time), which gives me enough for 4-5 mornings of "drip" coffee (drip referring to anything other than espresso). When I'm pulling shots, though, I can go through a batch in 3 days. I think the Hottop is very easy to use, and my preference is for the less expensive "B" model. The "B" model (as opposed to the programmable model) allows more user control and input during the roast. What's next? I keep reading about the new version of the Hottop, which reportedly will have a 1kg batch size. Short of spending $5000-7000 on a professional test batch roaster, I don't see how this could be beat. Fascinated by this! I love my coffee, have 3 brewers, but never got to this level. Scared to pick up another AD, but I still want to know. Why do it? Why roast your own? Is it because you want the freshest or is it that much better than your local roasters? (11-05-2013, 07:59 PM)beartrap Wrote: Fascinated by this! I love my coffee, have 3 brewers, but never got to this level. Scared to pick up another AD, but I still want to know. Why do it? Why roast your own? Is it because you want the freshest or is it that much better than your local roasters? I am at the stage now where I roast because I can't find better coffee out in town. I can find coffee that is just as good (one of the shops in town sells beans from Counter Culture, Madcap, PTs, Coava, and a few others). But that coffee is expensive, and it isn't roasted by me. Andrew -does roasting coffee produce much smoke? Do you have to do it outside or can you roast beans in the kitchen? Roasting produces enough smoke that you want to do it outside. The larger the batch, the more smoke. In addition to the smoke is the aroma - a little like burned popcorn. Your house/apartment will smell like this for the next day if you roast indoors. People have devised ventilation systems that work with the hood over their stoves, and these may keep the smoke and smell out. I haven't tried anything like that, though, as I have a nice spot in my garage to roast. Well, that leaves me out. I'm not going to the garage to roast anything when it's -20F outside. (11-06-2013, 06:43 AM)Johnny Wrote: Well, that leaves me out. I'm not going to the garage to roast anything when it's -20F outside. Not an issue here thankfully. My problem is space...no extra room in the garage. I guess I could roast in the back yard. When I lived in San Diego, I roasted outside on my back porch year round. I actually preferred that to my garage. Barry - if you are following this thread, what are your thoughts on the Huky 500? (11-06-2013, 08:00 AM)Andrew Wrote: When I lived in San Diego, I roasted outside on my back porch year round. I actually preferred that to my garage. Damn -now you have me looking on Sweet Maria's for coffee roasters. Thank goodness I am nowhere near wanting to do that and I do have a large porch right here in San Diego where I could, too.